Compass Wealth, LLC, is a financial services firm in Pittsford, New York, that has been servicing individuals, businesses and families for over 20 years. We specialize in customized financial planning, investment management, and global investing services. We have the freedom, as a fiduciary advisor, to develop your financial plan and investment strategy. Rob was recently featured in Advisor Magazine. Click here to read his views on a well balanced financial plan. 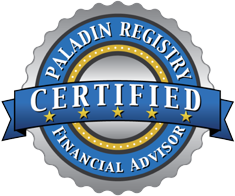 Paladin validated this professional’s credential and ethics information that is documented in Paladin’s research report and awarded this professional a 5 Star quality rating. View Research Report. Our financial know how is based on years of experience, highly regarded certifications and college degrees. We are financial fiduciaries (highest industry standard) when we provide planning and investment services for fees. We will always be transparent in all aspects of our relationship with you, including a clear explanation of our fees. MD’s check your physical well-being. Compass Wealth provides a free check-up for your financial well-being. We recommend global investment strategies for clients who want diversified portfolios and potential for reduced risk. As a financial fiduciary, Compass Wealth professionals are subject to the highest ethical standards in the financial services industry. Our clients want competitive rates of return for reasonable amounts of risk and expense.